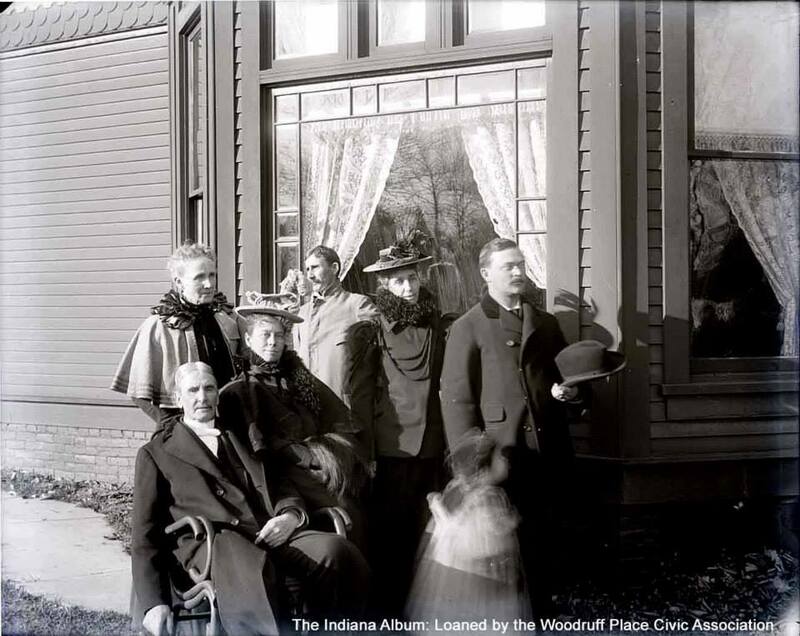 This week’s Indianapolis Then and Now column was originally published on October 13, 2011 and now includes updates. The Little Depot was officially named the Massachusetts Avenue Passenger Depot. According to a newspaper article it was constructed in 1870. This view from 1907 shows the front drive off of Massachusetts Avenue with the rear facing the recently elevated railroad tracks. The underpass at the intersection of Massachusetts Avenue and E. Tenth Street was much celebrated in Indianapolis as many deadly accidents had occurred at this curved crossing before the tracks were elevated in 1905. 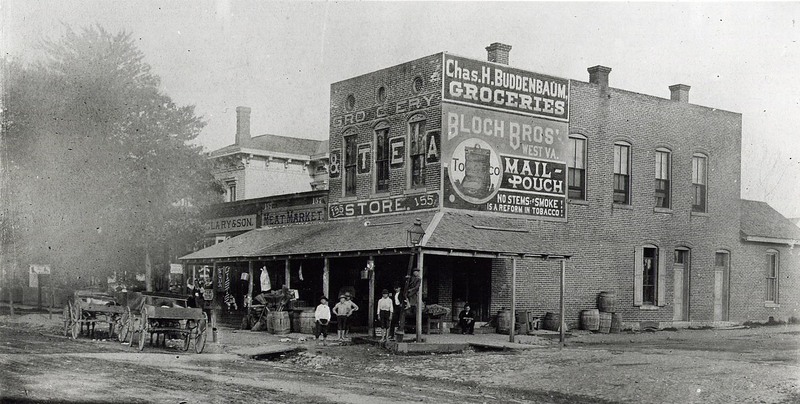 The place where I was born [in 1859] was called Brown’s Switch, which was my father’s lumber yard in Indianapolis. … The old “Peru Railroad,” now the Nickel Plate, had laid a switch into the premises. This switch was a stopping place for all trains on signal and took its name from my father’s business. 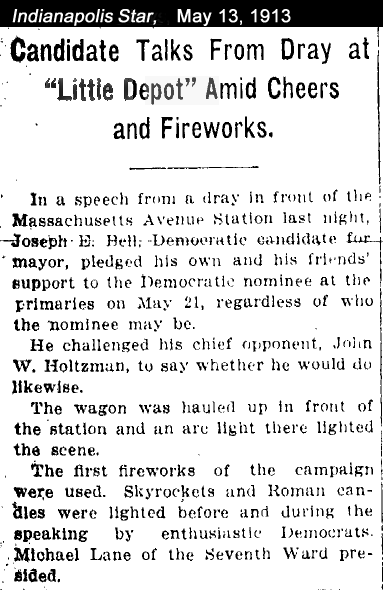 … This switch, as time developed, became, after the consolidation of the tracks of the Peru and Bellefontaine lines, the Massachusetts Avenue passenger station where all trains, under a city ordinance, must stop. The station long ago was abandoned, despite the old ordinance. The tracks were elevated and an underpass established at the head of the Avenue. 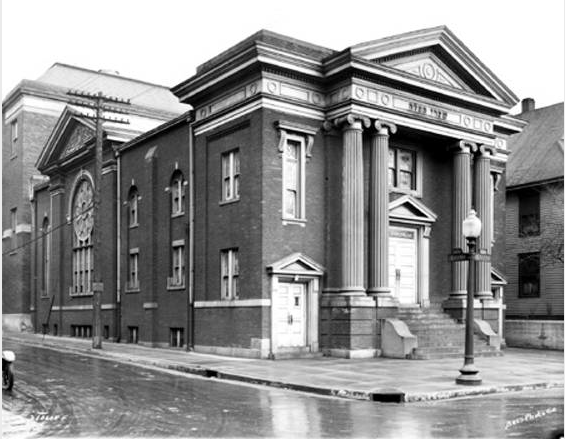 The station itself was a short distance below the junction of Tenth Street and Massachusetts Avenue. Only two station masters worked at the depot during its sixty or so year existence, with Benjamin F. “Frank” Mesker serving as the depot’s chief operator for nearly five decades. (Read more about Frank Mesker and his charming Windsor Park house on Arsenal Avenue). The depot originally had separate “Gents” and “Ladies” waiting rooms and baggage handlers helped Mesker with the daily tasks of ticket sales, telegraph operations, and tending fires in the two massive stoves. As train stops became less frequent, Mesker was the sole worker and appears to have been the heart of the station. He loved regaling his friends with stories of the past and recalled “Why, the type of engines they had on the Lake Erie and Western, the Monon and Bee line [nickname for the Bellefontaine Railway] fifty years ago easily could ride on top of one of the massive locomotives of today.” Mesker witnessed several important moments in Indianapolis’s transportation history. His obituary states that he was a passenger on the first streetcar and rode on the first train to circle the city on the Belt Railway in 1877. On his retirement he was replaced by J. W. White. 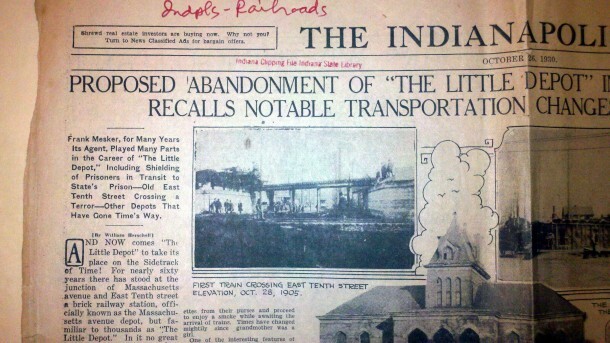 Old newspapers reveal that the “Little Depot” was much more than just a passenger station. The brick structure often served as the site for political speeches and torchlight rallies. One can imagine that a lot of gossip was relayed next to the warmth of those stoves. 1927 Baist Fire Insurance Map (IUPUI University Library) overlaid onto a 2009 Google aerial photograph. So many changes have occurred in this area due to the rerouting of Tenth Street and the intrusion of I-65/70 in 1970 that this 1927 map almost makes my head hurt. For those who want the nitty-gritty details, click on this annotated map to help get your bearings. 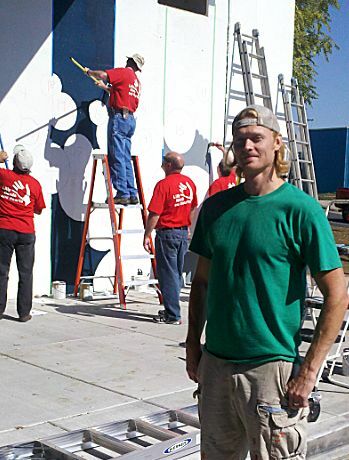 In October 2011, a large mural and planting project was completed after years of planning by the staff and volunteers of the East 10th Street Civic Association. 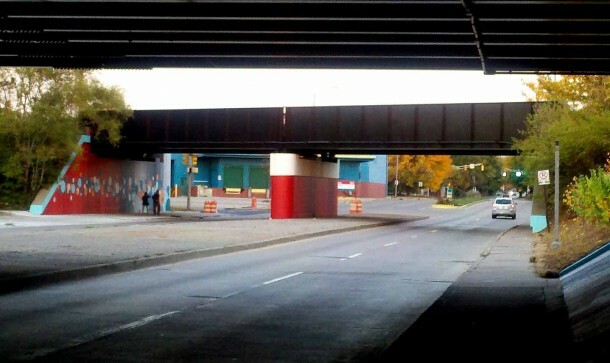 The CSX railroad underpass was overdue for a paint job and the two gloomy concrete I-65/70 overpasses acted as a dismal welcome to the Eastside. This is the only spot in the city where the Indianapolis Cultural Trail, Monon Trail, and the (eventual) Pogue’s Run Trail will connect. 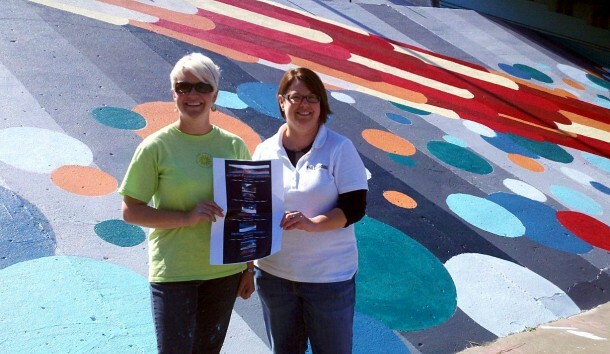 Civic Association staff Megan Sullivan and Tammi Hughes spearheaded the multi-partner facelift, which is part of the Urban Design and Gateway Implementation Plan. 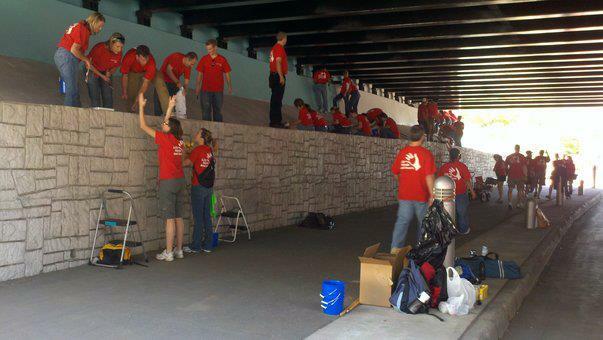 Over 8,000 Eli Lilly and Company employees volunteered for Indianapolis projects during Lilly’s Global Day of Service on October 6, 2011. 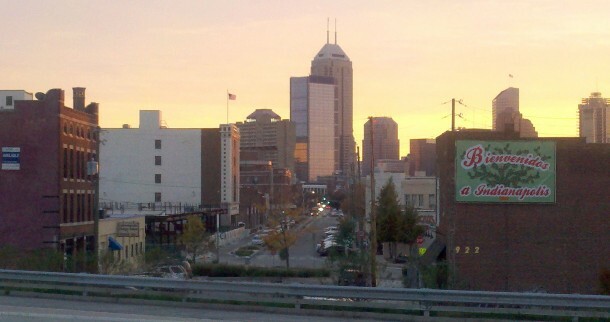 The East 10th Street/Mass Avenue gateway project consisted of significant landscaping and the painting of five murals, as part of the Arts Council of Indianapolis and the City of Indianapolis’s “46 for XLVI” mural program. 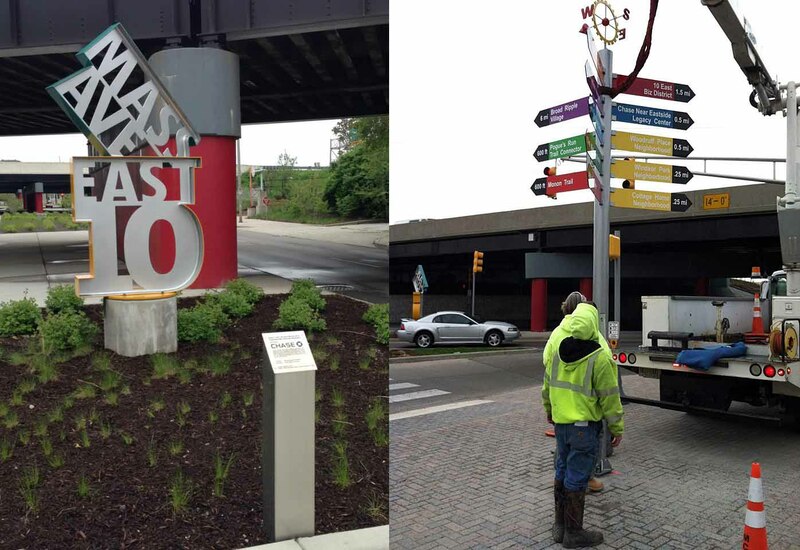 The East 10th Street Civic Association commissioned two identity and wayfinding signs at the intersection of E. Tenth Street and Massachusetts Avenue. The sign on the left was designed by Storrow Kinsella Associates and fabricated from aluminum. by Mike Lyons at !WowhuH? and Indianapolis Fabrications. Directional signs point the way toward trails, public buildings, and neighborhoods. 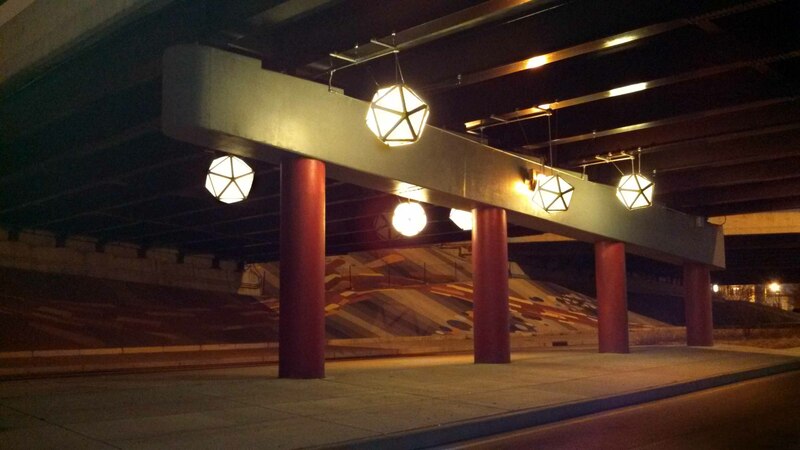 The latest improvement to the Payne Connect 10n gateway (named in honor of Brian and Gail Payne’s vision for connectivity throughout Indianapolis), is the installation of light globes inspired by Japanese paper lanterns at the eastside Feast of Lanterns. The canvas orbs use recycled RCA Dome roofing fabric. The Massachusetts Avenue Passenger Depot stood at this location on the far east end of Massachusetts Avenue, among a small cluster of brick and frame business buildings and factories. The depot itself was demolished in the late 1930s, while I-65/70 later wiped out many of the other surrounding structures. Today, the building housing Black Market restaurant at 922 Massachusetts Avenue (right) and the four-story brick commercial structure to the left (now home to Indy Reads Books) are among the oldest survivors in the thriving East End of Mass Ave. The old elevated tracks and interstate area looks drastically better and now welcomes thousands of motorists and pedestrians who pass through daily. Boosting the corridor even more will be the redevelopment of the Circle City Industrial Complex (the old Schwitzer Corporation building in the background), with construction to begin in 2015. Directly to the right stood “The Little Depot,” which survives in the memories of only a few. I’m sure Hilton U. Brown and Frank Mesker would be shocked and disoriented to see the latest improvements to their old neighborhood. Joan, thanks for pointing out exactly where this station was. I get touched whenever I take a tour group to the Confederate Mound at Crown Hill and tell Hilton Brown’s account of his early rememberance of his father saving the life of a Confederate prisoner more or less left to die along the tracks by giving him a cup of buttermilk to drink. Years later, while driving with his wife thru Kentucky, Brown had to stop, if I remember correctly, at a farmer’s house to get some water for his car’s radiator, and as they conversed, Brown discovered that the old farmer was the man his dad had helped all those years before. Makes me tear up just typing this. Thanks for this! Never heard of this station, despite being interested in Indianapolis railroad history. 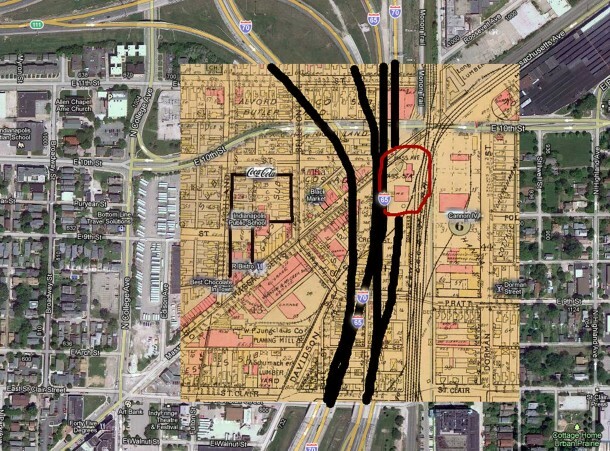 I’d like to see a map of the original routing of the railroad tracks into Indianapolis, before they were elevated. I assume they were either down Massachusetts or Ft. Wayne Avenues. Tom, I love those small world stories! I always enjoy your articles, Joan. My great-uncle was James Yuncker, and he owned the Coca-Cola plant at 860 Mass Ave. 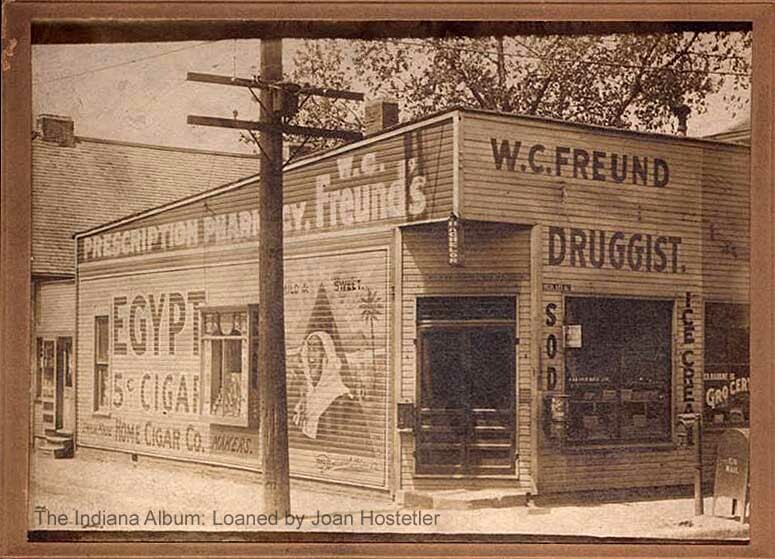 He was bottling ginger ale and other flavors at that location as early as 1907. He started bottling Coca-Cola in 1915. James died in 1964, and Tony Hulman bought the business and moved it to its current location next to the Motor Speedway. The old Coke plant on Mass Ave is still a very attractive building, and it is used by IPS. Craig, I believe a distant relative of mine was married to your great uncle. Some hazy family history here, and no one is left to confirm the details. Hazel (unknown maiden name) was a cousin of my grandmother Leola Trueblood Brooks, and the story we heard was that she had had physical/mental issues and was confined to her bed for many years. Not a happy ending. My brother recalls meeting her in the early 60s. We grew up in Speedway, and he worked part time during High School for a short time at the Coke plant. Would like to tie up the details on this person. I love that the building is still standing! My father, David Duthie, was a telegrapher for the New York Central Railroad and often worked at the switching tower that replaced the Little Depot. Occasionally as a young girl, I would go with him on a 2nd shift. This article reminded me that my father had told me that there had long ago been a station at the sight. An additional new fact for me was that my great-uncle, J.W. White had been station master at Mass. Ave. He and my great-aunt, Margaret (Maggie) McConaha White had been station masters in Brightwood. I believe that would have been before Mass. Ave. Thank you, Joan, for this interesting and informative article. I am the great niece of Jim Yuncker, My grandfather was George Yuncker, Jim’s brother. Grandpa owned the South Bend Coca-Cola Plant. My father worked for George as did my Uncle Jack. I remember visiting Uncle Jim on one occasion in particular; my sister and i were staying with other family members and we were invited to lunch. The dining room was grand and his office was what one would expect of an executive. He was an imposing man. Aunt Hazel was referred to as being eccentric. Some where there is a photo of her in a gown and turban. The family business actually started with Christian Harry Yuncker in Loudonville, Ohio. I believe that all but three of the his twelve children worked in the family business. I am currently working on the family tree and there is a wealth of information among surviving family members about the Coca-Cola connection.